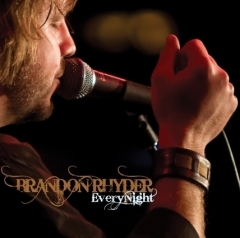 NASHVILLE, TN – August 27, 2008 – Ten years and five albums into his career, Brandon Rhyder has made his Billboard Top Country Albums chart debut with last week’s release, Every Night. Completely self-financed and released independently on his own Reserve Records, the album debuted at #53 on the Top Country Albums chart and at #50 on Billboard’s Top New Artist Albums chart. First-week sales for Every Night showed an increase of 100% over Rhyder’s prior release, Live, which has gone on to sell 10,000 copies and was the #1 seller for the College Station, TX Hastings for four weeks straight upon its August 2007 release. Every Night’s lead single, “This Ain’t It,” jumped from #22 to #16 on this week’s Texas Music Chart, and the accompanying video was shot recently at Gilley’s Dallas and will be released soon.